Molybdenum-catalyzed asymmetric allylic alkylation (AAA) involves the substitution of an allylic leaving group (an acetate or carbonate) by a stabilized carbon nucleophile, catalyzed by molybdenum(0) bound to a chiral ligand. Molybdenum-catalyzed reactions generally afford branched products and exhibit high enantioselectivity, in contrast to palladium-catalyzed allylic substitution reactions that yield linear products. AAA reactions catalyzed by molybdenum are often stereoconvergent and have been applied in dynamic kinetic asymmetric transformations. Metal-catalyzed allylic substitution reactions involve the formation of carbon-carbon or carbon-heteroatom bonds at electrophilic, allylic carbon atoms. These reactions tend to be milder than direct substitutions of allylic halides or sulfonates, and they can be rendered enantioselective using chiral ligands. Molybdenum catalyzes the substitution of allylic acetates and carbonates with stabilized carbon nucleophiles including malonates and unsaturated lactones and lactams (Eq. 1). Most molybdenum-catalyzed reactions exhibit high site selectivity form branched products and high enantioselectivity. Chiral catalysts such as 1 are pre-mixed with a molybdenum(0) source such as Mo(CO)6, and the allylic substrate and nucleophile are subsequently added. Studies of molybdenum-catalyzed AAA reactions have revealed detailed aspects of the mechanism of this process, some of which have been exploited for stereoselective synthesis from racemic starting materials. The reaction has been applied to the synthesis of unnatural α-amino acids, α-hydroxy acids, and other natural products. Mo-catalyzed AAA is typically employed at an early stage to set a key tertiary stereocenter. The strong preference of Mo-catalyzed reactions for branched products and generally high enantiomeric ratios observed (most in excess of 95:5) are significant advantages of this reaction over other metal-catalyzed allylic substitution reactions. Limited scope of the nucleophile is the most significant limitation of the reaction. The first step of the currently accepted mechanism of Mo-catalyzed AAA involves oxidative addition of the allylic substrate to chiral Mo(0) species 5 (Eq. 2). In most cases, the resulting π-allyl complex 2 is rapidly equilibrating with the diastereomer in which the opposite face of the allyl ligand is facing the metal. Carbon monoxide displaces the weakly bound carbonyl group to yield complex 3, and the nucleophile then coordinates to molybdenum to afford anionic complex 4 (no reaction occurs in the absence of a source of CO). Coordination of oxygen to the metal center is supported by DFT calculations. Reductive elimination of the product then occurs to regenerate complex 5. NMR spectroscopic and crystallographic data, along with deuterium labeling studies, support the intermediacy of the species shown in Eq. 2. Oxidative addition of branched allylic acetates to Mo(0) may proceed through either a retentive or an invertive mechanism. Although the stoichiometric reaction involves inversion, oxidative addition occurs with retention under conditions mimicking a catalytic process. This observation has been rationalized by invoking a difference in molecularity between the two processes: retentive oxidative addition likely involves one Mo(0) center, while invertive oxidative addition (which occurs when the effective concentration of Mo(0) is relatively high) likely involves two Mo(0) centers. Strong evidence for retention in both oxidative addition and reductive elimination is provided by the experiments outlined in Eq. 3 below. Allylic acetate 6 reacts readily to yield malonate 8 in which the configuration of the allylic stereocenter was retained, suggesting that reductive elimination is retentive with respect to the π-allyl ligand. On the other hand, the hindered, epimeric acetate 7 in which the leaving group is located in an endo position does not form a π-allyl complex in the presence of catalyst, suggesting that oxidative addition also occurs with retention of configuration. Studies involving deuterium-labeled substrates provide additional evidence of a retention-retention mechanism. Coordination of the nucleophile and reductive elimination are generally much slower than interconversion of diastereomeric π-allyl complexes of Mo(II). As a result, enantiomeric allylic acetates or carbonates equilibrate rapidly prior to product formation. This situation represents a dynamic kinetic asymmetric transformation (DYKAT) in which a racemic mixture of starting materials is converted to predominantly one enantiomer of product in a stereoconvergent manner. For example, a racemic mixture of (S)-9 and (R)-9 affords mostly product (R)-12 in the presence of catalyst (S,S)-1. In this context, mixtures of linear and branched substrates exhibit a similar effect. In some cases, when the configuration of the catalyst and that of the branched allylic substrate are mismatched, the observed enantioselectivity may be lower than the selectivity of the reaction involving the opposite enantiomer of catalyst. This somewhat counterintuitive result is rationalized by slow equilibration of diastereomeric π-allyl complexes. Slow equilibration in the mismatched case leads to the formation of a substantial amount of product from overall retention of configuration, even though the product corresponding to overall inversion is that favored by the catalyst. For example, product (R)-12 is favored by the catalyst based on ligand (S,S)-1 (Eq. 5). However, substrate (R)-9 is not properly matched to the catalyst; a retention-retention mechanism without equilibration of 10 and 11 leads to enantiomer (S)-12. The formation of a signficant amount of (S)-12 via this mechanism causes the enantioselectivity of this reaction to be lower than the corresponding reaction involving enantiomeric ligand (R,R)-1 (see Eq. 5, entries 1 and 2). Because the substrate appears to "remember" its configuration to some degree, the observed degredation in enantioselectivity is termed a "memory effect." The extent of memory effects can depend on solvent, ligand, and substrate. The configuration of the product is not, in general, affected significantly by the structure of the nucleophile (however, the scope of nucleophiles useful for this reaction is limited; see Scope and Limitations below). Allylic acetates and carbonates both react in Mo-catalyzed AAA reactions, although the latter are generally employed in synthesis owing to their greater reactivity. Although linear substrates are not subject to memory effects, branched substrates are more often used than linear substrates because of their ease of synthesis. Nucleophilic addition of an achiral vinylmetal reagent to an aryl or alkenyl aldehyde followed by treatment with methyl chloroformate affords a racemic branched allylic carbonate that can be subjected to allylic alkylation directly (Eq. 6). Aryl-substitued allylic carbonates are the most reactive substrates in Mo-catalyzed AAA reactions. Alkenyl-substituted substrates may be used but generally require heating. Alkyl-substituted allylic substrates work well in a limited number of cases. 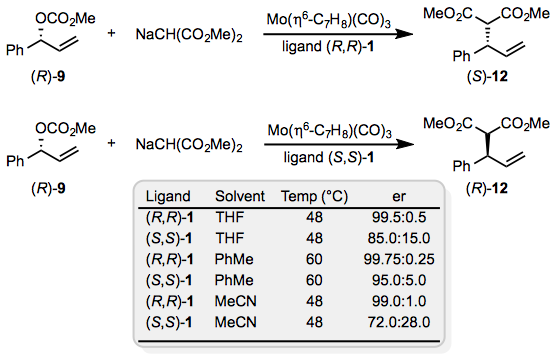 Mo-catalyzed reactions are highly selective for branched products, although branched-to-linear ratios can depend somewhat on the choice of solvent, ligand, and substrate (Eq. 7). For allylic acetates, the reactivity of the substrate has been shown to correlate with the Lewis basicity of the leaving group (Eq. 8). 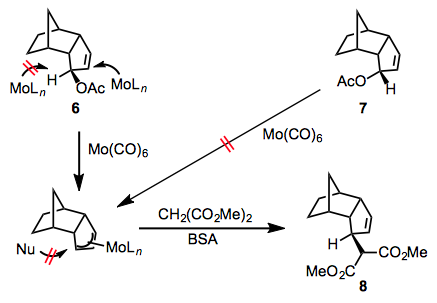 Coordination of molybdenum to a Lewis basic moiety in the leaving group appears to be a necessary prerequisite for reaction; put another way, the leaving group also acts as a directing group. The functional-group compatibility of this reaction is exceptional: ethers, silyl ethers, halides, ketones, esters, enol ethers, and acetals all survive the conditions of Mo-catalyzed AAA with no problems. The relatively narrow scope of the nucleophile is a significant limitation of Mo-catalyzed allylic alkylations. The scope of the nucleophile is limited to stabilized carbon nucleophiles. Acylic nucleophiles are nearly always ethyl or methyl malonates, although the scope of cyclic nucleophiles is slighly broader than this. α-Imino lactones bearing a substiutent at the nucleophilic carbon react well (Eq. 9); subsequent hydrolysis of the resulting products affords α-amino acids. Isomeric oxalactimes are also useful nucleophiles for this reaction. Two adjacent stereocenters are set by reactions employing tertiary nucleophiles (Eq. 10). Hydrolysis of the products of these reactions affords α-hydroxy acids. Oxindoles may also be employed as cyclic nucleophiles in Mo-catalyzed AAA reactions. Substitution at the nucleophilic carbon is accommodated for this class of nucleophiles as well (Eq. 11). Chiral ligands for these reactions tend to possess common structural features (Eq. 12). At least one pyridine ring (or other Lewis basic heterocycle) is necessary along with two rigid, unsubstituted amides and at least one stereocenter. One amide carbonyl oxygen is likely involved in the mechanism (see Eq. 4 above), and rigid chelation by the Lewis basic heterocycle and the other amide creates a well-defined stereochemical environment around the molybdenum center. Replacing the pyridines with dihydrooxazoles offers additional flexibility owing to the introduction of two new stereocenters. Molybdenum-catalyzed asymmetric allylic alkylation can be applied at an early stage of synthesis to establish the configuration of a key stereocenter. The development of cyclic nucleophiles that could be elaborated to common structural motifs signficantly increased the importance of the reaction in organic synthesis. For example, unnatural amino acids and esters can be synthesized using allylic alkylation of α-imino lactone nucleophiles. Basic hydrolysis or alcoholysis of the products of allylic alkylation leads to chiral, nonracemic α-amino acids or esters, respectively (Eq. 13). Substrates amenable to a DYKAT can be prepared as racemates and subjected to stereoconvergent allylic alkylation using a chiral molybdenum(0) catalyst. This strategy was used in a synthesis of tipranivir to convert an early, racemic intermediate into a nearly enantiopure substituted malonate (Eq. 14). A vast number of methods for metal-catalyzed allylation exist, and an exhaustive comparison of all of these methods will not be undertaken here. Palladium, ruthenium, iridium, rhodium, iron, and other metals have been applied for allylations of both carbon-based and heteroatomic nucleophiles. The mechanism of palladium-catalyzed allylation is well understood and involves invertive oxidative addition followed by nucleophilic attack on the coordinated allyl ligand. Generally, palladium-catalyzed allylations result in linear products (Eq. 15). Enantioselectivity of these reactions is high using chelating P-P, P-N, or N-N ligands. Decarboxylative allylations and allylations using heteroatomic nucleophiles are also possible under palladium catalysis. Iridium-catalyzed allylations also proceed through an inversion-inversion mechanism with net retention of configuration. Like molybdenum-catalyzed reactions, allylations involving iridium are highly selective for branched products (Eq. 16). The scope of the nucleophile is wider for iridium than molybdenum; heteroatomic nucleophiles may be used with the former. Memory effects are observed in some iridium-catalyzed reactions, although a judicious choice of ligand can lead to high site and stereoselectivity. Organocatalytic allylations are becoming an attractive alternative to metal-based methods. While metal-catalyzed methods typically use an electrophilic allylic substrate along with a nucleophile, some organocatalytic methods involve nucleophilic allyl sources reacting with electrophilic partners. For example, use of a basic catalyst in conjuction with a strongly activated substrate results in amination of an allylic anion in the presence of a chiral counterion (Eq. 17). Because the catalyst and precursors are sensitive to air, all Mo-catalyzed AAA reactions must be carried out under an inert atmosphere. Some source of carbon monoxide is needed for molybdenum-catalyzed allylations; the most common Mo(0) sources employed are thus Mo(EtCN)3(CO)3 and Mo(η6-C7H8)(CO)3. The former can be prepared from the latter by refluxing in neat propionitrile. Typically, the molybdenum source and chiral ligand are mixed at moderate temperatures (60-70 °C) for an hour or more prior to the introduction of the allylic substrate and nucleophile. 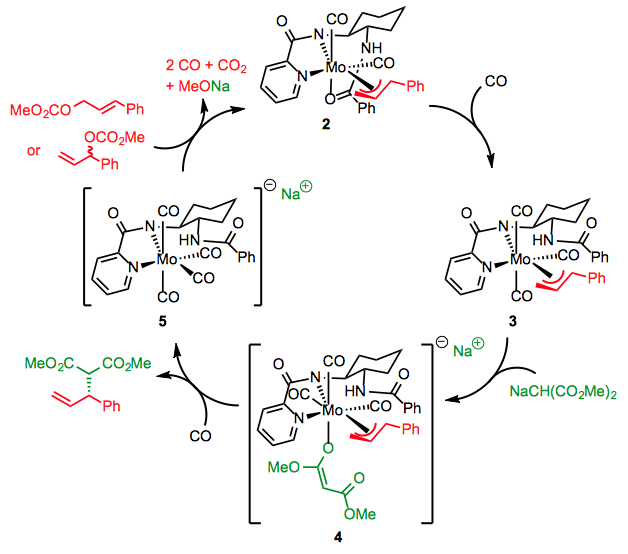 Complete formation of the chiral catalyst is important because the achiral precursors are able to catalyze the reaction. Although reactions employing Mo(CO)6 are generally more sluggish than reactions that use Mo(EtCN)3(CO)3, microwave irradiation has been applied with success to reactions involving Mo(CO)6. Inert atmosphere is not required for reactions that employ microwaves. A solution of Mo(EtCN)3(CO)3 (10 mol %) and chiral ligand (R,R)-1 (15 mol %) in THF (1 mL) was stirred at 60 °C for 1 h. A solution of sodium dimethyl malonate in THF (1 mL), prepared from dimethyl malonate (578 mg, 4.37 mmol) and NaH (160 mg of 60% dispersion, 4.00 mmol in THF (10 mL), and (E)-3-phenyl-2-propenyl methyl carbonate (0.2 mmol) were successively added at rt. After stirring at rt for 3 h, water (2 mL) was added to quench the reaction. The mixture was extracted with Et2O (3 × 15 mL). The combined organic layers were washed with brine (10 mL) and dried (MgSO4). The solvents were evaporated and the residue was purified by chromatography on silica gel (petroleum ether/EtOAc) to afford the product (35 mg, 70% purified yield, 90% yield by GLC) as a 49:1 mixture of branched (er 99.5:0.5) and linear isomers. Branched isomer: HPLC (Daicel Chiralcel OD, heptane/PrOH, 99.5:0.5, 0.5 mL/min, 220 nm) tR (minor, R) 26.89 min, tR (major, S) 29.11 min; Rf 0.32 (hexane/EtOAc, 6:1); [α]D20 –34.2 (c 2.02, CHCl3); IR (neat) 3031, 2954, 1737, 1435, 1263, 1197, 1163, 1027, 993, 926, 765, 702 cm–1; 1H NMR (300 MHz, CDCl3) δ 7.32−7.19 (m, 5H), 6.05–5.93 (m, 1H), 5.15–5.07 (m, 2H), 4.14–4.08 (m, 1H), 3.87 (d, J = 11.0 Hz, 1H), 3.74 (s, 3H), 3.49 (s, 3H); 13C NMR (75 MHz, CDCl3) δ 168.3, 167.9, 140.0, 137.8, 128.7, 127.9, 127.2, 116.7, 57.2, 52.5, 52.3, 49.6. ↑ a b Trost, B. M.; Lautens, M. J. Am. Chem. Soc. 1982, 104, 5543. ↑ Luft, J. A. R.; Yu, Z.-X. ; Hughes, D. L.; Lloyd-Jones, G. C.; Krska, S. W.; Houk, K. N. Tetrahedron: Asymmetry 2006, 17, 716. ↑ Hughes, D. L.; Lloyd-Jones, G. C.; Krska, S. W.; Gouriou, L.; Bonnet, V. D.; Jack, K.; Sun, Y.; Mathre, D. J.; Reamer, R. A. Proc. Natl. Acad. Sci. U.S.A. 2004, 101, 5379. ↑ Krska, S. W.; Hughes, D. L.; Reamer, R. A.; Mathre, D. J.; Palucki, M.; Yasuda, N.; Sun, Y.; Trost, B. M. Pure Appl. Chem. 2004, 76, 625. ↑ Krska, S. W.; Hughes, D. L.; Reamer, R. A.; Mathre, D. J.; Sun, Y. J. Am. Chem. Soc. 2002, 124, 12656. ↑ Faller, J. W.; Linebarrier, D. Organometallics 1988, 7, 1670. ↑ Ward, Y. D.; Villanueva, L. A.; Allred, G. D.; Liebeskind, L. S. J. Am. Chem. Soc. 1996, 118, 897. ↑ Dvořák, D.; Starý, I.; Kočovský, P. J. Am. Chem. Soc. 1995, 117, 6130. ↑ Lloyd-Jones, G. C.; Krska, S. W.; Hughes, D. L.; Gouriou, L.; Bonnet, V. D.; Jack, K.; Sun, Y.; Reamer, R. A. J. Am. Chem. Soc. 2004, 126, 702. ↑ a b Hughes, D. L.; Palucki, M.; Yasuda, N.; Reamer, R. A.; Reider, P. J. J. Org. Chem. 2002, 67, 2762. ↑ Gouriou, L.; Lloyd-Jones, G. C.; Vyskočil, Š.; Kočovský, P. J. Organomet. Chem. 2003, 687, 525. ↑ Trost, B. M.; Hildbrand, S.; Dogra, K. J. Am. Chem. Soc. 1999, 121, 10416. ↑ Kočovský, P.; Malkov, A. V.; Vyskočil, Š.; Lloyd-Jones, G. C. Pure Appl. Chem. 1999, 71, 1425. ↑ Belda, O.; Moberg, C. Synthesis 2002, 1601. ↑ Kuhl, A.; Christopher, J. A.; Farrugia, L. J.; Kocienski, P. J. Synlett 2000, 1765. ↑ Trost, B. M.; Lautens, M. J. Am. Chem. Soc. 1987, 109, 1469. ↑ Trost, B. M.; Merlic, C. A. J. Am. Chem. Soc. 1990, 112, 9590. ↑ a b Trost, B. M.; Dogra, K. J. Am. Chem. Soc. 2002, 124, 7256. ↑ Trost, B. M.; Dogra, K.; Franzini, M. J. Am. Chem. Soc. 2004, 126, 1944. ↑ Trost, B. M.; Zhang, Y. J. Am. Chem. Soc. 2007, 129, 14548. ↑ Del Litto, R.; Benessere, V.; Ruffo, F.; Moberg, C. Eur. J. Org. Chem. 2009, 1352. ↑ Glorius, F.; Neuburger, M.; Pfaltz, A. Helv. Chim. Acta 2001, 84, 3178. ↑ Trost, B. M.; Andersen, N. G. J. Am. Chem. Soc. 2002, 124, 14320. ↑ Trost, B. M.; Van Vranken, D. L. Chem. Rev. 1996, 96, 395. ↑ Kazmaier, U.; Stolz, D.; Krämer, K.; Zumpe, F. L. Chem.—Eur. J. 2008, 14, 1322. ↑ Franckevičius, V.; Cuthbertson, J. D.; Pickworth, M.; Pugh, D. S.; Taylor, R. J. K. Org. Lett. 2011, 13, 4264. ↑ Nakoji, M.; Kanayama, T.; Okino, T.; Takemoto, Y. Org. Lett. 2001, 3, 3329. ↑ Bartels, B.; García-Yebra, C.; Rominger, F.; Helmchen, G. Eur. J. Inorg. Chem. 2002, 2569. ↑ Dhanz, A.; Helmchen, G. Synlett 2006, 697. ↑ Miyabe, H.; Takemoto, Y. Synlett 2005, 1641. ↑ Poulsen, T. B.; Alemparte, C.; Jørgensen, K. A. J. Am. Chem. Soc. 2005, 127, 11614. ↑ Kubas, G. J.; Van Der Sluys, L. S. Inorg. Synth. 1990, 28, 29. ↑ Kaiser, N.-F. K.; Bremberg, U.; Larhed, M.; Moberg, C.; Hallberg, A. Angew. Chem., Int. Ed. 2000, 39, 3596. ↑ Trost, B. M.; Hachiya, I. J. Am. Chem. Soc. 1998, 120, 1104. This page was last modified on 2 May 2014, at 21:06.